To understand how Azure Sphere works in a real-world setting, consider this scenario. Microsoft releases updates for the Azure Sphere device software through the Azure Sphere Security Service. Contoso product engineering releases updates to its DW100 application through the Azure Sphere Security Service. Contoso dishwasher support communicates with the Azure Sphere Security Service to determine which version of the Azure Sphere software and the DW100 application software should be running on each end-user device and to glean any error-reporting data that has been reported to the service. Contoso dishwasher support also communicates with the Contoso cloud service for additional information. Contoso cloud services support applications for troubleshooting, data analysis, and customer interaction. Contoso’s cloud services may be hosted by Microsoft Azure, by another vendor’s cloud service, or by Contoso’s own cloud. 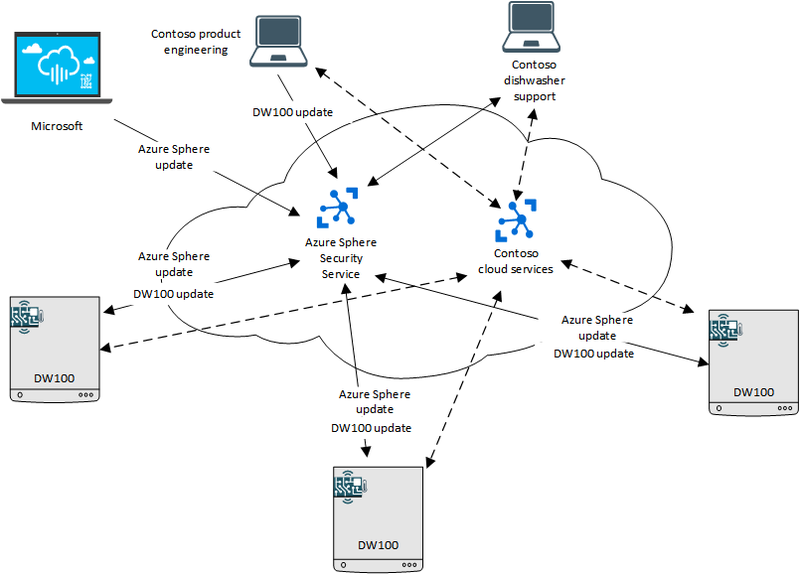 Contoso DW100 models at end-user locations download updated software over their connection to the Azure Sphere Security Service. They can also communicate with Contoso’s cloud service application to report additional data. For example, sensors on the dishwasher might monitor water temperature, drying temperature, and rinse agent level and upload this data to Contoso’s cloud services, where a cloud service application analyzes it for potential problems. If the drying temperature seems unusually hot or cool—which might indicate a failing part—Contoso runs diagnostics remotely and notifies the customer that repairs are needed. If the dishwasher is under warranty, the cloud service application might also ensure that the customer’s local repair shop has the replacement part, thus reducing maintenance visits and inventory requirements. Similarly, if the rinse agent is low, the dishwasher might signal the customer to purchase more rinse agent directly from the manufacturer. All communications take place over secured, authenticated connections. Contoso support and engineering personnel can visualize data by using the Azure Sphere Security Service, Microsoft Azure features, or a Contoso-specific cloud service application. Contoso might also provide customer-facing web and mobile applications, with which dishwasher owners can request service, monitor dishwasher resource usage, or otherwise interact with the company. Using Azure Sphere deployment tools, Contoso targets each application software update to the appropriate dishwasher model, and the Azure Sphere Security Service distributes the software updates to the correct devices. Only signed and verified software updates can be installed on the dishwashers.